I finally found a way to make kale that doesn’t require cooking. It’s a great salad for a hot summer day. Make sure that you mix the quinoa with the kale after it has been cooked. Share your photos and adaptations with us! To make the vinaigrette, whisk together olive oil, apple cider vinegar, lemon juice, lemon zest and honey in a small bowl; set aside. 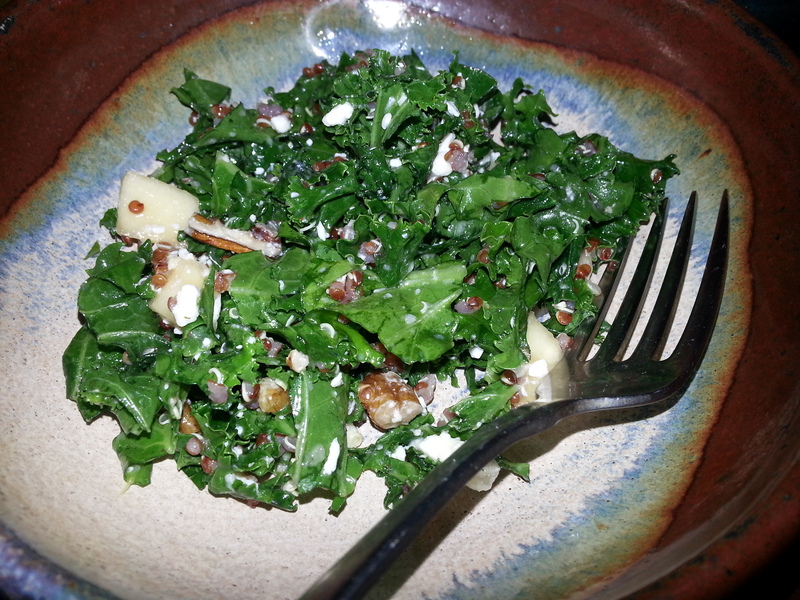 To assemble the salad, place kale in a large bowl; quinoa, chopped apple, pecans and goat cheese. Pour the dressing on top of the salad and gently toss to combine. Sounds healthy and delicious. I know I love cooked kale. What’s a quinoa? Quinoa is a grain. The Quinoa seeds contain essential amino acids like lysine and acceptable quantities of calcium, phosphorus, and iron.